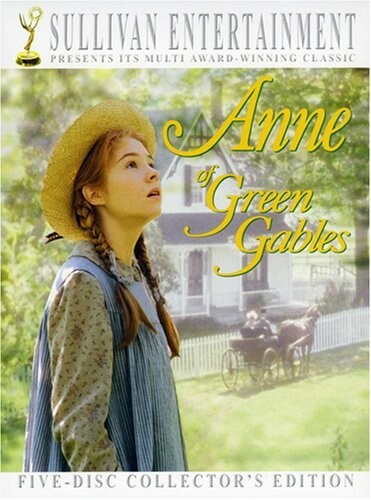 In this five-disc collector’s edition, Canadian novelist Lucy Maud Montgomery's celebrated novel Anne of Green Gables is brought to life in this enchanting three-part film! The first part of the story finds young Anne Shirley settling into her new life after arriving at the farm of her adoptive parents Marilla and Matthew Cuthbert. The second part of the tale finds Anne transforming from a bright young adolescent to a well-established teacher. The third and final part of the story sees Anne moving to New York with her husband Gilbert, and then back to Avonlea, where Gilbert becomes a soldier and goes missing during wartime. To view the Anne of Green Gables book collection or other Anne-related items, visit our Anne of Green Gables Collection. This gorgeous adaptation of Lucy Maud Montgomery's classic children's story is well worth watching with the whole family. Produced for Canadian television, it's one of those rare productions that actually sticks to the book and even enhances it through first-rate performances and an excellent script. Set on bucolic Prince Edward Island in the late 19th century, Anne of Green Gables is the story of Anne Shirley, an imaginative and headstrong orphan. When brother and sister Marilla and Mathew Cuthbert decide to adopt an orphan boy to help Matthew work the farm, they are astonished when Anne arrives at the train station by mistake. "What use is she to us?" grumbles the gruff Marilla. "We might be of some use to her," answers Matthew, who has taken an instant liking to the talkative Anne. As Anne grows up, her adventures are both hilarious and moving. It's a delight to watch as she forms a friendship with the beautiful Diana and her admirer--the dashing Gilbert Blythe--then dyes her hair green, cracks a slate over Gilbert's head when he calls her "Carrots," and finds a sympathetic teacher who encourages her to attend college.